At the beginning of this journey, I said that I'd be sharing everything about these 100 Days of Real Food, and sharing both the ups, and the downs. Today was hard. I felt very put-upon today. I was feeling like I'm being deprived, I was kind of angry, and feeling very sorry for myself. It was pretty silly, but that's how I felt! Part of the problem is that I found out that there's a fundraising initiative at work (which is great) over the month of November. The problem (from my perspective) is that the fundraising is in the form of food trucks coming to my work on 3 Tuesdays during the month. In the mood I was in today, all I could think about was what I COULDN'T have. I didn't see that even if there wasn't ANYTHING I could have, it really wasn't the end of the world. So what if I can't have anything right now? Are food trucks winking out of existence? Um, no. Am I going to DIE if I don't get to try everything, or even anything? Nope. Will I feel super guilty and like a complete failure if I give in? YOU BET! Is it worth it? No. But it sure tormented me nevertheless! Now, it's evening, and I'm feeling better about things. This is the single best thing I've ever done for myself, and I need to remind myself of it more often I think. I also need to dwell more on the positives of these 100 days, because quite honestly, they FAR outweigh the negatives, even just at day 12! 1) My "time of the month" cravings (sorry guys) are WAY easier to take. I don't feel like a ravening monster, saliva dripping from my sharp teeth, grasping at chocolate/fried stuff/baked stuff, completely out of control. The feeling sorry for myself today so did NOT compare to that! 2) I also "during this time" am a lot more even-keeled emotionally. I haven't experienced the roller-coaster ride I usually do. There have been a few tougher moments, but again, not NEARLY as bad as usually happens. 3) My body FEELS different. I don't really know how to describe it, though the word "content" keeps popping in my mind when I try to think of a good descriptive word. Can your body have emotions? I don't know, but my body feels...content. So day 12 down. I think overall things are going well. My resolve hasn't changed (well, maybe for a few minutes today!) and I'm glad I'm staying strong. On to day 13! 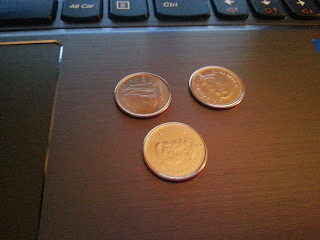 Money left from this week: $.30!